If you prefer to run and supervise your own hockey party, you may RENT Party Pucks equipment. Set-up and teardown by Party Pucks is included. Each game comes with it's own platform or table (if renting more than one game, then games are set up on a 6ft. banquet table). Prices include drop off and pick up. Travel fee may apply to some cities. Due to the nature of some of the vintage games only the PowerPlay 2 and Stiga games are available for rental. *There is a 2 game minimum for rentals. 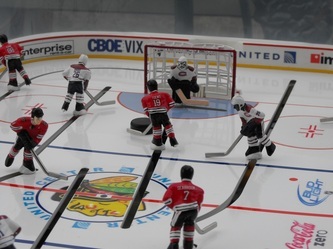 Your Choice of Toronto, Boston or Chicago and includes all original 6 teams with current rosters (molded players). 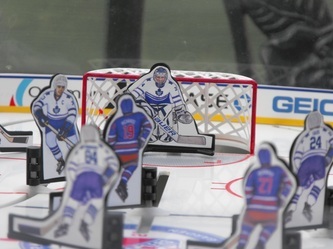 Stiga PlayOff International Table Hockey Game is also available (only Canada and USA teams to choose from at the moment). Your Choice of New York, Montreal or Detroit and includes all original 6 teams with current rosters (flat players). *A $30 non-refundable deposit is required at time of booking. Cancellations must be made at least 10 business days in advance. Email us at info@partypucks.com to check availability and to schedule your party!